There is no better time than the present to anoint another Independence Bank Player of the Week. Independence Bank is proud to sponsor a weekly article highlighting players in the areas where Independence Bank flourishes who embody the same type ofrevolutionary service to their respective football teams which has made Independence Bank unique and special in the banking industry. Independence Bank has a goal of achieving everyday excellence, and this week we are focusing on a player whose performance both has and continues to exceed both the Owensboro Catholic and Owensboro community’s expectations. 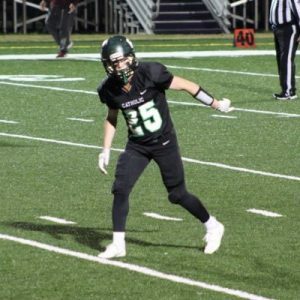 Today we are focusing on Class of 2020, WR, Hagan Edge, who plays at Owensboro Catholic. Owensboro Catholic is located right down the road from 3 Independence Bank branches on 2425 Frederica Street, 2465 W. Parrish Avenue, and 3228 KY-54, respectively. The situation around the Aces football program is the classic good news-bad news scenario. The Aces return the best QB in the western-end of Kentucky and maybe, with apologies to Beau Allen at Lexington Catholic and Reed Lanter at Boyle County, the best in all of Kentucky. Putting aside the superiority debate, Hartz, who threw for 2,606 yards in 2018 with 32 passing TDs against only 7 picks, is a safe bet to put up All-State-type statistics in 2019, his last trip around the high school football maypole. Now who’s going to run the football and replace Vonn Williams’ level of productivity (145 carries, 1,313 yards from scrimmage, 17 of the team’s 33 rushing TDs) is a 64-dollar question? Who’s going to fill in for both Nick Mills (65 receptions, 975 receiving yards, 15 of the team’s 32 TD receptions) and Quanya Gary (25 receptions, 432 receiving yards, 4 TD receptions) is another? We believe Harold Hogg will hog most of what would have been Williams’ work-load if Williams had any remaining eligibility. Hogg made the most of his 60 carries, in 2018, gaining 479 yards and carrying it over the goal-line 4 times. He looks poised to fill-in for the departures in the backfield carrying the football way more often than over his junior year. Receiver-wise, we look for this week’s Revolutionary Player of the Week to shoulder much of the burden for the departing. Last year, with Mills and Gary around to help-out, Edge still caught 22 passes for 444 yards and 5 TDs receiving. His 5 TD-receptions were good for second on the entire team in that all-important statistic. Edge will be getting targeted by one of Kentucky’s very best at the QB-slot and it will be interesting to see what Edge is capable of doing when he finds himself option-one in the downfield throw-game. We believe he’s ready for the challenge. Congratulations to Hagan Edge for his Revolutionary Play which has earned this week’s recognition from the fastest growing bank in the Commonwealth of Kentucky…your friends at Independence Bank. This is F.W. 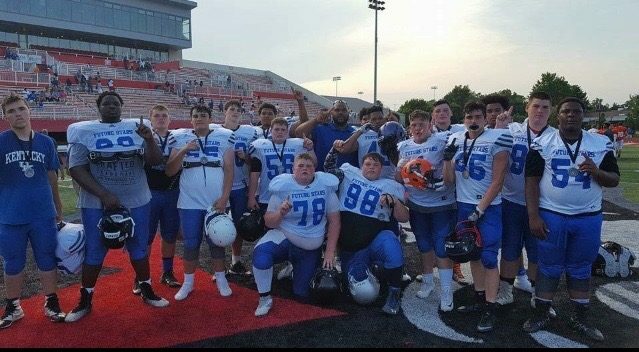 Long reporting for Kentucky Prep Gridiron reminding you to PLAY THROUGH THE WHISTLE!